Forsythbiz: Thinking outside Charlie's box! Forsyth Mo. 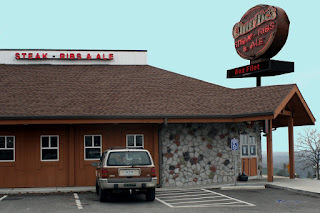 – A once very popular eatery known as Charlie's Ribs Steak and Ale located at the intersection of Hwy 160 and Y in Forsyth Missouri closed sometime back, went up for sale and then sat there doing not much of anything for quite a while. It was soon apparent to me that there was a problem with it ever getting sold. The 4300 square foot establishment was well built and appointed and yet was difficult to sell. Part of the reason was the high asking price of $850,000. That was a lot of money to recoup in a town of about 2300 that had ten or more other eateries all within the city limits! Well, you get the idea. I think that old expression 'Divide and conquer' does apply in this situation. Two or three investors could work together to renovate the interior into two or three new businesses. Heck, even the City of Forsyth or Taney County could perhaps make this spot into a profit producing entity to help offset other costs to residents. Like I said, it will take someone or some group with --- wait for it--- foresight! Update: Apparently the owner's wanted to try the auction route as a sign that was recently posted announced that a public auction was to be held on May 11 at 10:00 AM. See above right. So, who wants to bet that bids will fall short of the reserve amount? And, if the auction fails, then what. A fire sale?